Can you benefit from HomeCaravan? *127 Visitors - Are all of them here to see your house? When you sell, an average of 127 strangers will enter your home. Sure, most are buyers, Realtors and inspectors, but when selling your home, you need to take precaution. Thieves know that with many visitors, it will be hard to pinpoint exactly who stole your valuables. Always know who is coming over and when. Get valuable feedback to gauge buyer interest and know when it is time for price reductions or other changes to bring in additional traffic. All family members are looped into the showing calendar so you can all work together to make your home look its best for buyers when they arrive. This is a wonderful app that saved us so much time coordinating with agents who want to show our home. No more phone tag when I’m at work. 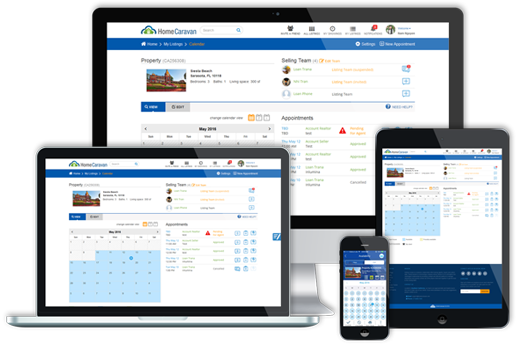 I work out of my home, so scheduling is quite difficult, with HomeCaravan, I can set aside times that work for me and agents can only show my home when it fits my schedule. We have a 17 year old son who comes and goes – he doesn’t want to be home when agents show up any more that they want him there. With HomeCaravan, he always knew when people were coming over and he’d take his basketball across the street to the park for a bit. He loved using this app as much as we did. Feedback from agents that have toured our home really helped us make it more appealing for others. I honestly could imagine this service become customary for all home sales – more security, no more hassle talking with agents during work, and flexibility to schedule showings when I want. What's not to like? Our family expanded rapidly when we had twin girls and we needed a larger home quickly. Their sleep schedule takes priority over everything in our home. HomeCaravan allowed us to group showings outside of naptime and this makes mom very happy. For a limited time, get HomeCaravan absolutely free. Enter your home's address below. Thanks for signing up - information on how to get HomeCaravan for free will be sent to you shortly! Selling a home is a massive collaborative effort among agents, buyers and sellers alike. HomeCaravan is a technology company whose mission it is to establish and strengthen the client/agent relationship by providing a simple and efficient platform to manage interactions and quickly connect all of the players that work together to get the deal to the closing table.